In its coverage of the Syrian crisis, the fledgling Al Jazeera America cable news channel provided viewers with content that often resembled what Americans saw on other U.S. cable news outlets, according to a new study by the Pew Research Center. The showdown over Syria’s chemical weapons is the first mega-story to break since Al Jazeera America’s much-publicized launch on Aug. 20. One major question was whether the channel-an offshoot of the Qatar-based Al Jazeera network-would present news largely through a U.S. perspective or provide an alternative, more global, view of events. The findings in this report suggest that if Syrian coverage is any indication, Al Jazeera America is targeting its programming at the domestic U.S. audience its owner has long tried to reach. 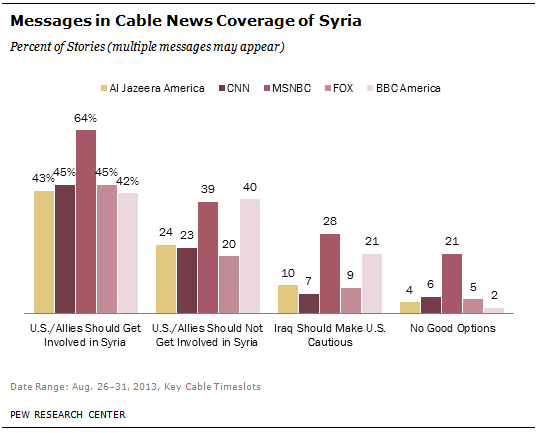 The analysis of cable coverage during a crucial week in the Syria story found that in a number of areas-where stories originated, the focus of stories, key messages in stories and the mix of reporting and opinion-Al Jazeera America was largely in sync with its U.S. cable news competitors, most often CNN. Like CNN, MSNBC and Fox News, Al Jazeera America devoted the biggest chunk of Syria coverage to the debate over whether the U.S. should become militarily involved in the conflict that pits the government of Bashar al-Assad against an array of rebel forces. The most common message conveyed in Al Jazeera’s coverage-that the U.S. should get involved in the conflict-was also the No. 1 message on CNN, MSNBC and Fox News. BBC News America news programming, some of which originates in London, was more of an outlier in its coverage of Syria. The sources cited most often in coverage by the U.S. cable channels-American politicians and policymakers-were also by far the most frequent in Al Jazeera America’s coverage. And as was the case with CNN, Fox News and MSNBC, the overwhelming majority of Al Jazeera America’s coverage originated from the two main U.S. news hubs-Washington, D.C., and New York City. In some of the coverage there was evidence of Al Jazeera America’s international roots. The channel framed more of its stories, albeit a small minority, around the humanitarian crisis in the region caused by the Syrian civil war. In addition, more of its stories originated from Mideast countries (other than Syria) than its cable competitors. A breakdown of coverage of the Syrian crisis during the period studied reveals that CNN, by far, spent the most time on the subject-about 381 minutes or nearly six-and-a-half hours of programming. Al Jazeera America outpaced Fox News, 273 minutes to 220. And MSNBC ranked last, at 194 minutes. Because BBC America airs few news programs than the other cable outlets, one-third fewer hours were analyzed in the report. Even so, BBC America spent as much time on Syria as MSNBC, at 194 minutes. Close to half of the Al Jazeera America stories on the Syrian crisis (43%) focused on the U.S-centric debate over whether this country should get militarily involved in Syria. That puts the channel in the middle of the cable spectrum, higher than BBC America (25%) and CNN (36%), but below the more partisan-oriented cable networks, MSNBC (62%) and Fox News (64%). The message that was conveyed most frequently in Al Jazeera America’s coverage of Syria was that the U.S. should respond militarily, appearing in 43% of the outlet’s stories. That was very close to the breakdown on CNN, Fox News (both 45%) and BBC America (42%). Only MSNBC, at 64%, had a markedly higher number. 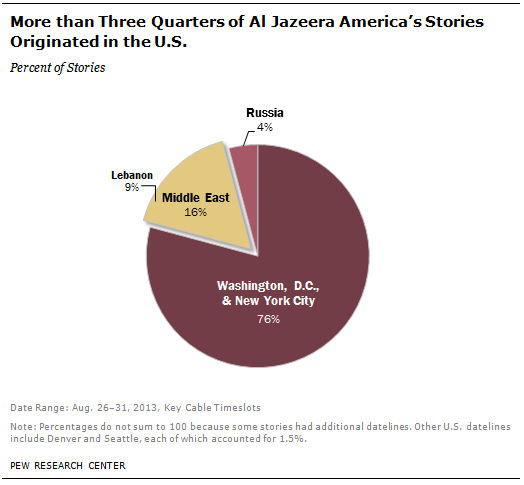 Despite having access to more than 60 international Al Jazeera network bureaus, about three-quarters (76%) of Al Jazeera America stories originated from Washington, D.C., or New York City. That is slightly higher than CNN (71%) and lower than MSNBC (85%) or Fox News (94%). Only 19% of BBC America’s coverage originated from those two cities compared with 42% coming from London. In its use of sources, Al Jazeera America often tracked closely with CNN. President Obama or members of his administration showed up in 66% of Al Jazeera America stories compared with 59% on CNN. 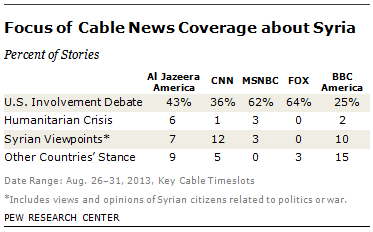 Syrian sources were cited in 26% of Al Jazeera America stories and 24% on CNN. On both channels, congressional representatives were sources in 16% of the stories. In addition to Al Jazeera’s coverage, some broader findings in the overall cable coverage stood out. While a number of polls show that a large majority of the U.S. public is against military action against Syria, in the week studied, the overall percentage of cable stories conveying a message that America should get involved (47% ) solidly outnumbered stories with messages counseling against a strike (27%). While the complex Syrian crisis includes a variety of key players and issues, two-thirds of the overall cable coverage was framed around three topics-the debate over U.S. involvement (44% of the stories), chemical weapons themselves (14%) and scenarios for an American military response (9%). Stories focused on the Syrian government or the views of Syrian citizens accounted for 7%. Once the U.S. government accused the Assad regime of using chemical weapons-an action President Obama had previously identified as a “red line” not to be crossed-the key question was whether the U.S. would respond militarily. In the coverage studied, the debate over that question was the dominant focus on CNN, MSNBC and Fox News-as well as on Al Jazeera America. Overall, the debate over whether U.S. should become militarily involved in the Syrian conflict, combined with a discussion of the military scenarios, accounted for nearly half the coverage on Al Jazeera America (47% of the stories) and CNN (48%). Those frames were more dominant on Fox News (77%) and MSNBC (67%), largely because those channels-with their heavy diet of politics-focused more on the Washington-centric debate over a U.S. response. On BBC America, which paid considerably more attention to London’s role in the crisis, they accounted for only 29%. The topic of the use of chemical weapons figured into each channel’s coverage, with 13% of Al Jazeera America’s stories framed around that issue. That was somewhat less than CNN (19%), but more than BBC America (10%) and Fox News (8%). Two other story frames that offered a Syrian perspective on events-the views of Syrian citizens and a focus on that nation’s government-played a smaller role in the coverage. And that was true for Al Jazeera America as well. Together, they were the focus of 7% of its stories, less than on both CNN (12%) and the BBC America (10%), but considerably more than on MSNBC (3%) or Fox News (0%). In this case, Al Jazeera’s roots in the Mideast did not translate into significantly more framing from the Syrian perspective. In two areas, however, Al Jazeera America did focus its stories around a more global and less U.S.-oriented perspective. Six percent of its stories were framed around the humanitarian crisis in the region caused by the conflict that has taken more than 100,000 lives. That was more than any of its cable rivals. This greater focus on humanitarian coverage stood out on the Aug. 30 edition of Al Jazeera America’s nightly 10 p.m. show, “Consider This,” which aired a 12-minute long story on conditions for the about two million Syrian refugees living in neighboring countries such as Turkey and Lebanon. In addition, 9% of Al Jazeera America stories about Syria were framed around other countries’ views of the conflict (not including England). Of the U.S. cable channels, CNN was closest at 5% while BBC America devoted even more attention to the subject (15%). Just as Al Jazeera America shared the big three U.S. cable channels’ focus on whether the U.S. would respond militarily, so too did it share the messages conveyed about that issue. This report examined the key messages or sentiments that were present in the stories about Syria, and on Al Jazeera America-along with CNN and Fox News-sentiments in favor of military intervention far outnumbered those opposed to a military response. The percentage of stories that included the message that the U.S. and its allies should get militarily involved was 43% on Al Jazeera America, 45% on CNN and 45% on Fox News. Conversely, the message that the country should not strike Syria militarily appeared in 24% on Al Jazeera America stories, 23% of CNN’s and 20% of Fox News stories. In all three cases, messages favoring U.S. military action outnumbered those opposed by about a 2:1 ratio. Those ratios were different, however, on BBC America, where the message in favor of U.S. involvement (42% of stories) barely exceeded the sentiment to avoid military action (40%). And on MSNBC, messages favoring military action appeared in 64% of the stories, but a substantial percentage (39%) also conveyed sentiments against U.S. intervention. This report also tracked a number of messages in the coverage that were somewhat critical of the U.S. or sent up warning flags about possible military action. And in most of these cases, the messages in Al Jazeera America’s coverage did not offer a harsher or more skeptical view of the U.S. than its rivals. The idea that the U.S. and its allies don’t understand the complexities of the Middle East, for example, was negligible on Al Jazeera America (0%) as was the case on most cable news channels. (It did register in 1% of the CNN stories). The daunting idea that there are no good options for the U.S. in this crisis appeared in 4% of the new channel’s stories compared with 5% on Fox News, 6% on CNN and 21% on MSNBC. Another red flag message involved comparisons to the situation in Iraq in 2003, when allegations about weapons of mass destruction (which proved to be non-existent) were a major reason the U.S. attacked Saddam Hussein. The message that the Iraq experience should make the nation more wary of U.S. intelligence assessments was marginally higher on Al Jazeera America (10%) than on Fox News (9%) and CNN (7%) and considerably less frequent than on BBC America (21%) and MSNBC (28%). Another worrisome sentiment, that U.S. military involvement would last longer than anticipated, appeared in only 3% of the stories Al Jazeera America, the same level as MSNBC and slightly lower than Fox News (5%) and CNN (4%). Again, it is BBC America, at 13%, that is the outlier, rather than Al Jazeera America. The cautionary message that a U.S entry into the Syrian conflict would lead to larger Mideast problems appeared in 16% of Al Jazeera America stories, followed closely by CNN (14%) and then by MSNBC (10%) and Fox News (8%). And that was far lower than the frequency of that message on BBC America (31%). During an Aug. 31 broadcast on Al Jazeera America, correspondent Mike Viquerie made that point in discussing a letter from Joint Chiefs of Staff Chairman General Martin Dempsey, warning of possible consequences of military action. “You are taking the lid off all of these disparate elements-Hezbollah, Al Qaeda, on opposite sides of this thing, Iran, Syria, the regional conflagration that never seems to end,” Viquerie said. As was the case with CNN, Fox News and MSNBC, by far the most prominent sources cited in Al Jazeera America’s coverage for the week were the U.S. leaders at the epicenter of the crisis-Barack Obama and members of his administration. Those individuals were cited as sources in two-thirds of Al Jazeera America’s coverage, making them somewhat more prevalent than on CNN (59%) and MSNBC (54%) and somewhat less prevalent than on Fox News (75%). But the source of perhaps the most noteworthy pronouncement during the week studied in this report was Obama himself, who surprised many by seeking a congressional vote. Another significant category of sources came from the U.S. congressional ranks, many of whom were hitting the cable circuit to weigh in on the situation. Those sources showed up in the same percentage of stories on both Al Jazeera America and CNN (16%). They appeared considerably more frequently in coverage on Fox News (36%) and MSNBC (38%). On the other side of the aisle, Republican Scott Rigell of Virginia told MSNBC’s Rachel Maddow on Aug. 27 that the president needed to go to Capitol Hill, saying Obama “had a duty to call Congress back into session.” Those sentiments were echoed in an e-mail message co-authored by House Speaker John Boehner. “Under the Constitution, the responsibility to declare war lies with Congress,” he said. In another sign that the new entrant into the cable competition was focusing on a U.S. perspective of events, fully 26% of its stories featured a former U.S. diplomat or former or current U.S. military personnel as a source, more than any of its rivals.MSNBC was next, at 18%. None of the channels made much use of ordinary U.S. citizens as sources, but Al Jazeera America and Fox News had the most, at 3%. A number of Syrian sources-including government and military officials, rebels and ordinary citizens-were cited in the coverage. All totaled, they appeared in 26% of the Al Jazeera America stories. CNN was close at 21%, well ahead of Fox News (11%) and MSNBC (5%). Overall, they were cited most frequently on BBC America, appearing in more than one-third (38%) of its stories. When it came to sources from Mideast countries other than Syria, Al Jazeera used a higher proportion (9%) than its U.S. rivals. CNN was next, at 6%, with both Fox News and MSNBC citing those sources in 5% of their stories. In the run-up to its launch, Al Jazeera America trumpeted the fact that aside from five overseas news bureaus of its own, the outlet would have access to 65 international bureaus in the broader Al Jazeera network. But in the Syria coverage studied, the young news channel relied heavily on stories that originated from two U.S. locations-Washington, D.C., and New York. From Aug. 25-31, fully 76% of Al Jazeera America’s stories originated from those two cities, modestly more than CNN (71%) and four times more than BBC America (19%). The two channels that generally focus most intently on U.S. politics, MSNBC (85%) and Fox News (94%), were even more U.S.-focused in their datelines. The number of datelines originating in Syria may have largely been a function of which outlets were able to get access to the war-torn country, where media coverage is severely restricted. Here, BBC America and CNN led the way with 17% and 10% of their stories respectively coming from Syria, compared with Al Jazeera America, at 1%. At the same time, Al Jazeera America did produce the highest percentage of coverage that emanated from a group of Syria’s Mideast neighbors-from Turkey to Jordan to Egypt. Fully 15% of the channel’s stories had datelines originating there, with most of them (9%) coming from Lebanon. CNN and MSNBC were next at 10%, while Fox News had the lowest percentage of Mideast datelines (6%), all of which came from Israel. Another 4% of Al Jazeera America’s stories originated from a country that proved to be a key player in the crisis-Russia. That was more than any other cable outlet besides BBC America, at 6%. One way Al Jazeera America says it hopes to distinguish itself from its cable competitors is to de-emphasize television “shout-fests” in which ideological foes engage in heated rhetoric. But that doesn’t mean opinion doesn’t have its place on the new channel. An earlier study of cable news content by the Pew Research Center found that with the narrow exception of CNN, more cable airtime is devoted to presenting opinions rather than producing reporting. That is particularly true in prime time, which often devotes itself to polarizing political and ideological debate. But in the cable coverage of the Syrian crisis, reported stories dominated commentary and opinion, in both daytime and prime time and for each outlet. In the reporting vs. opinion divide, Al Jazeera America hewed more closely to the mix at MSNBC and the Fox News than to CNN or BBC America. Of its stories about Syria, 63% were dominated by reporting while 37% were categorized as commentary. That compares with a 59%-41% ratio on Fox News and a 64%-36% split on MSNBC. CNN, which has branded itself as the home of extensive reporting resources, had the highest quotient of reporting, 86% of its stories, compared with 14% that were opinion. BBC America was next with a 77%-23% split. But while commentary had a home on Al Jazeera America during the Syrian crisis, the channel produced a higher percentage of reported and edited story packages about Syria than any of its rivals other than BBC America. From Aug. 26-31, more than third (35%) of Al Jazeera America’s stories took the form of these packaged pieces. That compared with 26% on CNN, 22% on Fox News and 18% on MSNBC. BBC America was the top producer of story packages, at 42%. The recent Pew Research Center study on cable news content found that interviews fill more cable airtime than any other type of format. 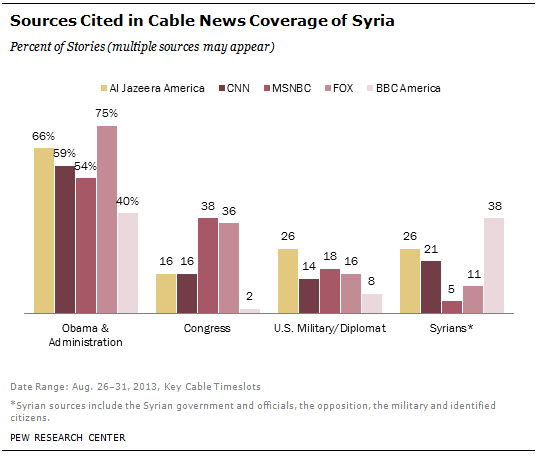 In the Syria coverage studied, that was a particularly dominant format on Fox News (58% of stories) and MSNBC (46%). One-third (34%) of Al Jazeera America’s stories took the form of interviews, very similar to the level on CNN (34%) and BBC America (35%). Al Jazeera America did, however, rely more on live staff reports (27% of stories)-which involve correspondents reporting from locations outside the studio-than most of its cable news competitors. CNN aired the highest percentage of live reports at 36%, well ahead of MSNBC (18%), BBC America (15%) and Fox News (14%).